Winnipeg Transit is not terrible. There, I said it. The buses are clean, the operators generally friendly and the service is pretty decent if you live in an area close to a major route. Winnipeg Transit has even made some updates in recent years that I love, such as the signs telling you when the next bus arrives and BUStxt — the service that allows you to have real-time schedule data texted to your phone. What’s holding us back is our city’s ingrained attitude toward the automobile and our refusal to invest real dollars and political capital in an effective rapid transit system. I’ll address our attitude first. We Winnipeggers love our cars, and I can’t really throw any stones here; I love driving and do it way more than I need to. I can’t really be blamed, though; our city is set up to favour car-commuters. If you disagree, think about how you would go about getting from your house to Transcona or Waverly West. Even if there are bus routes, odds are you’re in for a lot of walking, and a couple of hours on a bus — OK if you’re going to hang out with a friend in the summer, a completely different story if you need to commute for work in February. The problem is, in my mind, that we’re too damned spread out. Winnipeg has an estimated population of 684,100 people living within the Perimeter, and yet we occupy 464.01 square kilometres. Montreal, on the other hand, has more than five times the population in just three quarters the space. How can a transit system expect to serve such a spread out population efficiently? Put simply it can’t, and as a result people turn to their cars. And with the building of subdivisions on the outskirts of the city, such as Waverly West, the problem is just getting worse. It would be easy to blame the people buying these houses in the middle of nowhere, or the politicians who keep on approving their construction, but it’s what we apparently want as a city. However, if we’re going to continue to expand we need to start factoring transit into the equation — something we have utterly failed to do thus far. One ray of hope — indicating that our car-culture might be changing — is the what has been dubbed “the first transit-orientated development in Winnipeg’s history.” Also known as the Fort Rouge Rail Yards, this project, which the city just guaranteed $10 million in loans for, will eventually include 900 units, divided between townhouses and two 21-storey highrises, all built adjacent to the new rapid transit corridor. Ideally residents of this new community will simply jump on rapid transit rather than take their car, acting as an example to all of us Winnipeggers, but that’s making a big assumption: that rapid transit will be completed and practical. 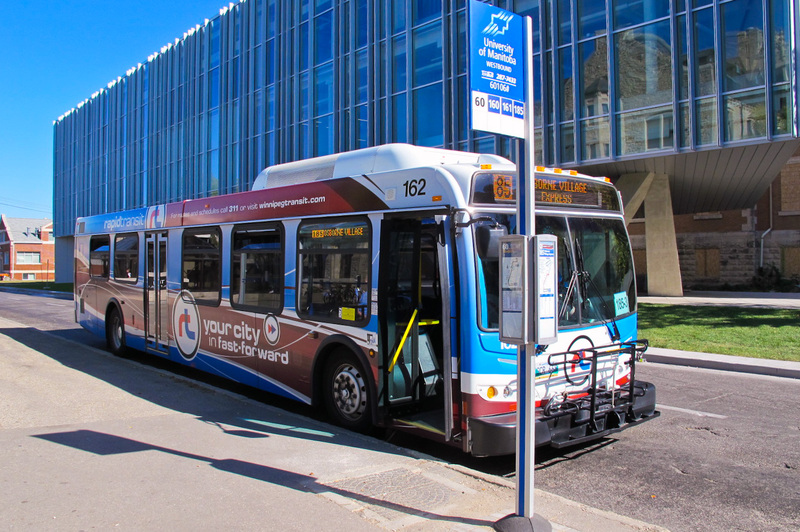 As for phase two, the city can’t even agree at this point whether to pursue light rail (LRT) or bus rapid transit (BRT) for the whole thing, let alone where the funds for the second leg — from the Jubilee overpass to Bison drive, near the University of Manitoba — will come from. And that’s where my second criticism lies. We, as a city, are pursuing rapid transit in such a half-assed way that it is going to take decades to complete this thing, and when it is done it’s going to be such a mess that no one will want to ride it. Who is going to ride this thing from the Forks to Bison drive? Who is going to want to switch from a BRT to an LRT system in -40c weather? No one. What we need is a decisive, complete and fully funded plan, but where is the political will to see this thing through? In the past 13 months we’ve had a civic, federal and provincial election, and not once did I see a single mainstream politician campaigning on completing our rapid transit system. Sure, it was mentioned when asked, but the responses I heard were never definitive. The reason this is the case, from where I’m sitting, is because students are the main people this system will benefit, and students don’t vote. If the thought of having a proper rapid transit system excites you, you don’t have to wait four years for another election to do something about it. If you’re sick of having one of the most inadequate transit systems in the country pick up a pen and write your city councillor, MP and MLA. Tell them you want better public transit, and that you’re willing to pay them with your vote should they take up your cause. Only then will Winnipeg get the system it deserves, not the one city council, the province and feds eventually agree to cobble together.